Iodine is routinely used for cleaning purposes in commercial kitchens. It is a well-known sanitizing agent and is commonly found among the supplies for commercial kitchens at stores that sell such equipment. Iodine has three main uses in commercial kitchens: to clean, to test the strength of cleaners and to purify water. You will find that iodine test strips are a part of the regular roster of supplies for most commercial kitchens. 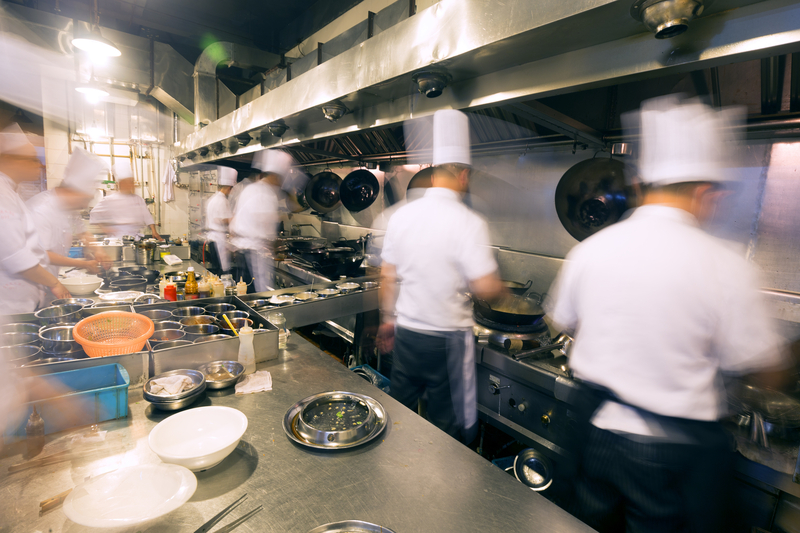 It is important for kitchens that serve large numbers of people to make sure their plates, cups and utensils are as clean as they can be after each washing. Iodine can be used to clean things directly. Additionally, it can be added to a solution of other cleaning agents to make it stronger, and it can also be used on its own. It is suitable for cleaning wounds and to use to clean the skin before surgery, so it is certainly suitable for cleaning anything in a kitchen. If it is used directly as a cleaning agent, care must be taken as to where it is placed. This is because iodine, in its pure form, leaves behind a reddish-brown stain that can be difficult to remove. Iodine can be used directly on dark or same-colored items, but is most commonly and effectively used when it is mixed with other cleaning agents to create a strong cleaner for the commercial kitchen. Using iodine test strips, the kitchen personnel can tell if the dish washing detergent they are using is of an appropriate strength to get the items clean enough to serve food on to customers. The iodine test strips can also be used to test the strength of other cleaners used with the commercial kitchen space. As an example, any surface on which food, or things in which food is served, will be placed has to have an unquestioned cleanliness. Iodine test strips will ensure that the surface cleaner is strong enough to provide a perfectly sanitary surface for food service and preparation. A good commercial kitchen does not take risks with the health of its customers by using unfiltered water. Iodine is an excellent water purifier, and many of the water filters on the market contain iodine in their cartridges. When the water runs through the filter on the way to the faucet, it is pushed through the iodine in the cartridge, and any impurities are drawn out of it before it goes in a pot, pan, cup or glass. Iodine tablets can be used to purify large amounts of water for cooking or serving as drinking water if the water is unfiltered and stored in a large container prior to use. In addition, if there are times where the regular water supply is not available or is of questionable quality, such as after a storm or natural disaster, iodine tablets can be used to keep the water pure in the commercial kitchen. As you can see, iodine has many important uses in the commercial kitchen. It is worthwhile to make it a part of your own commercial kitchen for its reputation for cleanliness, and the health of your customers. For more information, contact us today.